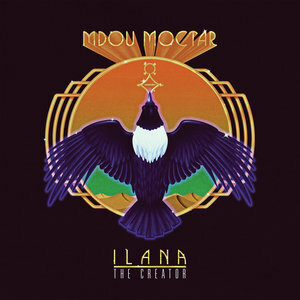 Let's make no bones about it: "Ilana", the politically-charged title track of Nigerien desert blues guitarist Mdou Moctar's new album Ilana: The Creator, is the most intense and technically perfect piece of rock and roll I've heard this whole quarter. On it, Moctar goes all in on energy, lets loose tidal waves of melody, and shreds on electric guitar as only he can. Maybe I'm getting ahead of myself. Ilana actually begins with "Kamane Tarhanin", a song that starts out with strings and voices in the distance before the drums kick in. For the rest of the track, Moctar goes all in on energy, lets loose tidal waves of melody… do you see what I'm getting at? There is no shortage right now of proficient Saharan guitarists in the international music market, of course. Bombino springs to mind easily, as do bands like Tinariwen, Tamikrest, Imarhan, and Etran Finatawa. Each artist has a different approach, of course; Tinariwen set a precedent for melancholy blues, while Bombino's brand of "Tuareggae" sets a brighter tone and Imarhan looks farther north for influences. History of the Tuareg desert blues phenomenon aside, Mdou Moctar is in a realm of his own. His first commercial album, Anar, came out in 2008, loaded with Auto-Tuned vocals and thin, electronic beats that drew heavily on other styles of music from West Africa. On it, Moctar took a hypermodern approach to Tuareg groove, rooted in the popular dance music of the moment. Since then, his style has grown into something with more lasting appeal. Ilana still sounds fresh and different from anything Moctar's contemporaries do, but it is wholly based on his considerable skill as a rock guitarist and songwriter rather than on trying to get in on current trends. Take, for example, track "Tarhatazed". Seven and a half minutes long, it begins with a fierce guitar solo from Moctar over a background whirlwind of bass and drums. Halfway through is another, and a final short solo finishes the song. The entire piece draws on Moctar's primary strength as a live performer, both at weddings and on international tours, and is perhaps the best attempt yet at capturing his raw onstage energy. For the first time on a studio album, it feels like we are hearing Mdou Moctar at full capacity, the production clear, minimal, and true to life. Even at his most low-key, as on instrumental track "Takamba" or mellow closer "Tumastin", Moctar's skill stays sharp, his hands constantly moving. On the latter, his syncopated guitar work transforms a hypnotic melody into something more ornate, a breezy end to a whirlwind of an album. In person, Mdou Moctar is a nonchalant genius, seemingly effortless in the way he sets off sonic fireworks on song after song with the speed of his nimble fingers. On Ilana, his dynamic style at last comes through on a recording. This is a remarkable album, and made even more so by Moctar's insistence that the concept of rock music as a genre is fairly new to him. What he does is not rock for rock's sake, but music for music's, and that might be the most rock and roll approach of all.